In the recent model-data comparison of satellite-era sea surface temperature anomalies—appropriately titled Maybe the IPCC’s Modelers Should Try to Simulate Earth’s Oceans—we compared trend maps of modeled and observed sea surface temperature anomalies from 1982 to 2013. See Figure 1. The models showed a general warming of the Pacific with the highest warming rates in the tropics and in the northwest North Pacific. In the real world, the data showed a C-shaped warming pattern, with extensive warming along the Kuroshio-Oyashio Extension east of Japan and along the South Pacific Convergence Zone (SPCZ) east of Australia and New Zealand, and with little to no warming in the tropics or the Eastern Pacific. It has come to my attention that some persons believe the start and end dates are responsible for the C-shaped pattern; that is, they think the C-shaped pattern appears in the data trend map because the Reynolds OI.v2 sea surface temperature data start in an El Niño development year and end with an ENSO-neutral year (which was preceded by back-to-back La Niña events). Their assumption is wrong, of course. The warming pattern does not depend on the start and end years I’ve used for the trend maps. The warming pattern is caused by what Kevin Trenberth and others called “ENSO residual” effects in their 2002 paper The Evolution of El Niño and Global Atmospheric Surface Temperatures. It might be easier to think of El Niño residuals as leftovers from strong El Niño events. First, let’s confirm that the C-shaped warming pattern in the Pacific does not depend on the 1982 (El Niño development) start year and 2013 (ENSO-neutral) end year. And to do that we’ll reverse the extremes; that is, we’ll start in a year with La Niña conditions and end with El Niño. 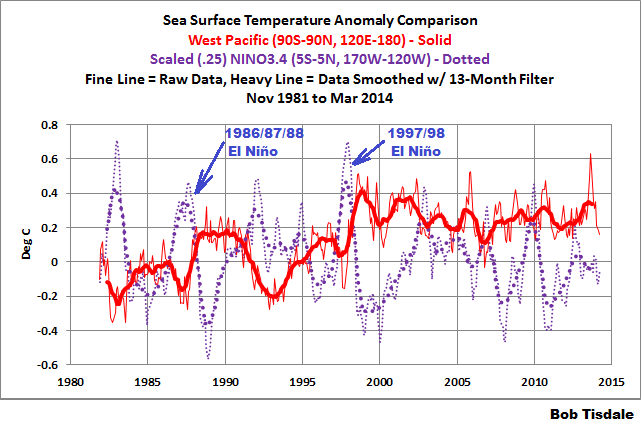 According to NOAA’s Oceanic NINO Index (ONI), 1984 began and ended in “official” La Niña conditions. Both trend maps in Figure 2 start in 1984. The 2009/10 El Niño evolved in 2009 and decayed in 2010, so I’ve presented trend maps with both 2009 and 2010 as end years: 2009 on the left and 2010 on the right. The C-shaped pattern appears in both maps. As noted earlier, starting the trend maps during an El Niño year and ending them during an ENSO-neutral year, used in the earlier post, did not cause the C-shaped spatial warming pattern in the Pacific Ocean. That pattern also exists if we start the trend map during a La Niña and end during an El Niño. That C-shaped warming pattern of the Pacific sea surfaces exists even if we start the trend analysis as far back as 1977. See Figure 3. That is the first year after the 1976 Climate Shift, which, as you’ll recall, raised the sea surface temperature anomalies of the East Pacific Ocean almost 0.2 deg C. I’ve presented trends from 2 sea surface temperature reconstructions for the period of 1977 to 2013 in Figure 3, NOAA’s ERSST.v3b on the left and UKMO’s HADISST on the right. We’ll return to the satellite-enhanced Reynolds OI.v2 sea surface temperature data for this part of the discussion. Figure 4 presents the sea surface temperature anomalies of the West Pacific Ocean. I’ve added a few notes to it. Since November 1981, the sea surface temperatures there warmed in two steps. 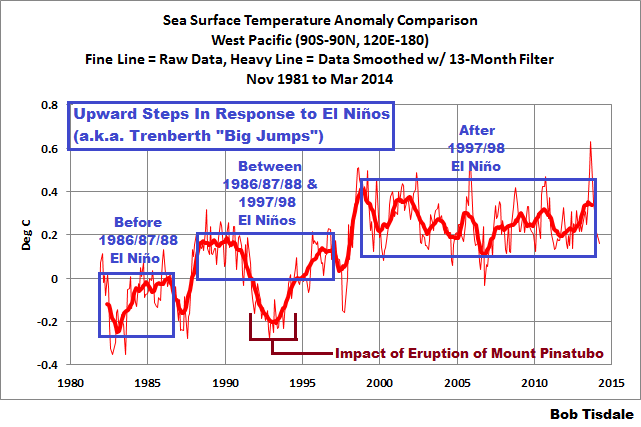 The first step was in response to the 1986/87/88 El Niño and the second step was a response to the 1997/98 El Niño. After the 1997/98 El Niño, there was little to no longer-term warming there, just some year to year variations caused by the subsequent and lesser El Niño and La Niña events. Additionally, between the 1986/87/88 and 1997/98 El Niños, the sea surface temperature data for the West Pacific also show no warming. The big dip and rebound starting in 1991 is a response of the sea surface temperatures of the West Pacific Oceans to the eruption of Mount Pinatubo. The oceans can at times soak up a lot of heat. Some goes into the deep oceans where it can stay for centuries. But heat absorbed closer to the surface can easily flow back into the air. That happened in 1998, which made it one of the hottest years on record. Trenberth says since then, the ocean has mostly been back in one of its soaking-up modes. “They probably can’t go on much for much longer than maybe 20 years, and what happens at the end of these hiatus periods, is suddenly there’s a big jump [in temperature] up to a whole new level and you never go back to that previous level again,” he says. You can think of it like a staircase. Temperature is flat when a natural cool spell cancels out the gradual temperature increase caused by human activity. But when there’s a natural warm spell on top of the long-term warming trend, the story is dramatically different. Kevin Trenberth is obviously still trying to keep alive the notion that greenhouse gases are responsible for the warming of the global oceans. In Figure 5, I’ve added an arbitrarily scaled ENSO index to the graph (dotted purple curves) to confirm the timing of the upward steps. NINO3.4 sea surface temperature anomalies are a commonly used index for the timing, strength and duration of El Niño and La Niña events. And in Figure 6, I’ve compared the West Pacific data to the sea surface temperature anomalies of two other subsets of the global oceans. 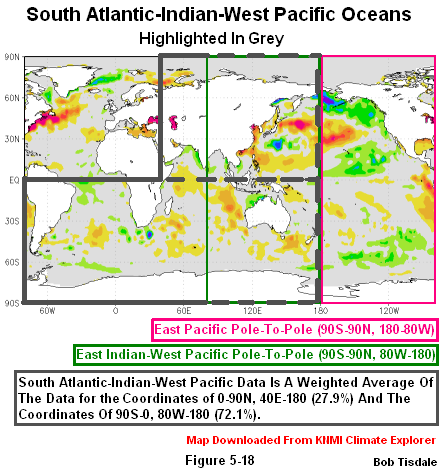 The East Indian-West Pacific data was the first subset of the global oceans where I reported on the upward steps. That was more than 5 years ago. See the posts “Can El Niño Events Explain all of the Global Warming Since 1976?” Part 1 and Part 2. (The WattsUpWithThat cross posts are here and here for those who want to review the comments.) I later expanded the region where the sea surface temperature data show the upward shifts to include the South Atlantic, Indian and West Pacific Oceans, which is also shown in Figure 6. (See the map here for the location and scale of that subset.) The South Atlantic, Indian and West Pacific subset covers more than 50% of the surface of the global oceans. All three subsets of the global oceans show the same basic El Niño-caused upward shifts, and that makes sense since they share common data. The following is a very brief description of how the upward steps are created. An El Niño event releases a colossal volume of warm water from the surface and, more importantly, from below the surface of the western tropical Pacific and spreads that warm water across the surface of the eastern tropical Pacific. In the cases of the 1997/98 El Niño and the 1987/88 portion of the 1986/87/88 El Niño, that warm water spread east as far as the west coast of the Americas. The El Niño does not “consume” all of the warm water that had traveled east, so after the El Niño peaks and the trades winds resume, the trade winds push the leftover warm surface water back to the West Pacific. And there is another phenomenon called a slow-moving Rossby wave that returns the leftover subsurface warm waters to the West Pacific. Ocean currents carry all of the leftover warm water poleward creating the C-shaped warming pattern in the Pacific…and into the Indian Ocean. In the animation of sea level anomalies here (Animation 3-1 for my ebook Who Turned on the Heat? ), an example of a slow moving Rossby Wave can be seen carrying leftover subsurface warm water, from east to west, at about 10N, following the 1997/98 El Niño. Simply put, before the El Niño there was a huge amount of warm water stored below surface of the western tropical Pacific. While it was below the surface, it was excluded from the surface temperature record. During and after the El Niño, that warm water is now on the surface, raising the sea surface temperature of the global oceans (and raising land surface air temperatures in response). On the threads of blog posts over the years, the upward steps have been described by some persons as a ratcheting effect. I created and collected a number of animations of the 1997/98 El Niño and its aftereffects for my ebook Who Turned on the Heat?. They are linked to and discussed in the blog post Animations Discussed in “Who Turned on the Heat?”. Animation 6.1 presents a series of sea surface temperature anomaly maps before, during and after the 1997/98 El Niño. I’ve used maps of 12-month average sea surface temperature anomalies to minimize weather noise and the seasonal cycle in the data. Also included in the animation is a comparison graph that infills as the animation progresses. One of the datasets is a scaled ENSO index (NINO3.4 sea surface temperature anomalies) to show the timing of the 1997/98 El Niño and the trailing 1998-01 La Niña. 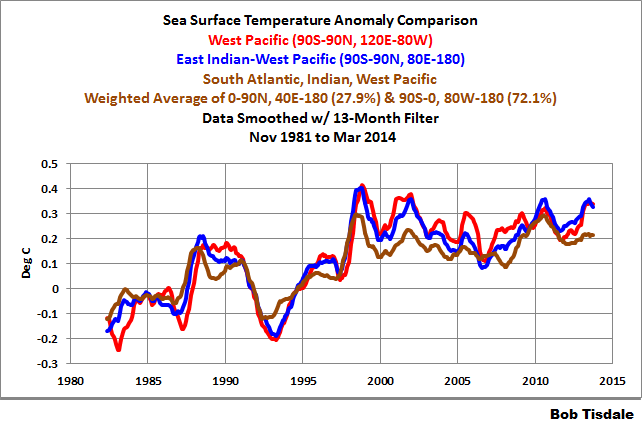 The other dataset in the graph is the sea surface temperature anomalies of the East Indian and West Pacific Oceans. Also see Figure 6 above. So you can watch the upward shift take place in the East Indian and West Pacific data and also watch the C-shaped warming pattern form. If the subject of long-term aftereffects of El Niño events is new to you, refer to the illustrated essay The Manmade Global Warming Challenge (42MB). It includes additional discussions of the upward shifts (the Trenberth “big jumps”) in sea surface temperatures. In 2012, I published my e-book about the phenomena called El Niño and La Niña. It’s titled Who Turned on the Heat? with the subtitle The Unsuspected Global Warming Culprit, El Niño Southern Oscillation. It is intended for persons (with or without technical backgrounds) interested in learning about El Niño and La Niña processes and in understanding the natural causes of the warming of our global oceans for the past 30 years. It presents how the sea surface temperature data and ocean heat content data account for their warming—and there are no indications the warming was caused by manmade greenhouse gases. None at all. Who Turned on the Heat? was introduced in the blog post Everything You Ever Wanted to Know about El Niño and La Niña……Well Just about Everything. The Free Preview includes the Table of Contents; the Introduction; the beginning of Section 1, with the cartoon-like illustrations; the discussion About the Cover; and the Closing. Please buy a copy. (Paypal or Credit/Debit Card). You do not need to have a PayPal account. Simply scroll down to the “Don’t Have a PayPal Account” purchase option. It’s now sale priced at US$5.00. The satellite-enhanced Reynolds OI.v2 sea surface temperature anomaly data used in this post is available through the NOAA NOMADS website. The trend maps were created at, and the ERSST.v3b and HADISST sea surface temperature data, are available through the KNMI Climate Explorer.